Sea salt's graininess exfoliates dry, dull skin. Salt is one of the cheapest items at the grocery store, but don't let its low cost fool you. 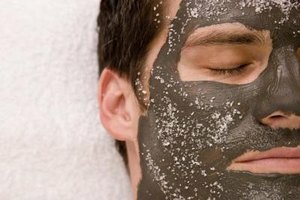 With a few pinches of the stuff, you can make a wonderfully gritty facial scrub like the ones you find at the priciest spas. Salt alone won't stick to your skin well, so you need to mix it with a drizzle of oil. Many oils, such as olive and avocado, also offer nourishing benefits that liven up dull, lifeless skin. Pour 1/8 cup of sea salt into a small bowl, then add 1 to 2 teaspoons of finely chopped mint leaves. Mix in a drizzle of apple-cider vinegar, then stir until the ingredients form a paste. Rub the salt mixture into your skin, then rinse off with warm water. Refrigerate leftovers for up to three days. Combine 2 cups of sea salt, 1/2 cup grapeseed oil, 1/2 cup olive oil and five to 10 drops of patchouli oil in a bowl. Mix in 1/2 cup of uncooked oatmeal. Apply the mixture to your face, then rinse. This scrub keeps for six months if refrigerated. Mix together 1/2 cup of sea salt and 1/4 cup of lemon juice in a bowl. Stir well until a thick paste forms. Massage the scrub into your face, then rinse with cool water. Repeat up to twice a week. Store leftovers in the refrigerator for three days. Combine 1 cup of sea salt with 1/2 cup almond, avocado, grapeseed or rosehip oil. Add five to 10 drops of essential oil for fragrance -- try lavender, orange, geranium or peppermint oil. Blend ingredients to make a paste. Rub the mixture on your skin, then rinse. Keep the remainder of the scrub in the refrigerator for up to six months. Try substituting the sea salt in these recipes for a more exotic variety, such as Hawaiian black-lava salt or Himalayan pink salt. Look for these salts in a health-food shop or gourmet grocery store. Don't use table salt to exfoliate; the grains are too small.